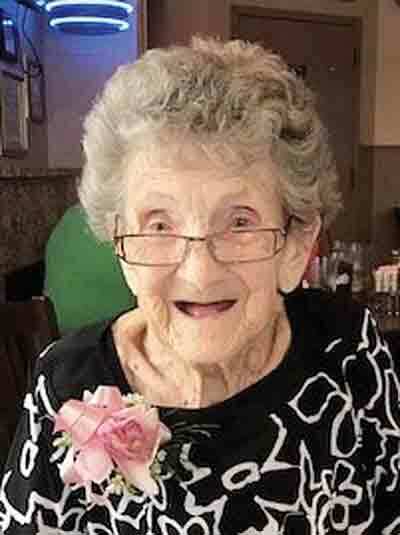 Mary Louise “Weezie” McKitrick, 94, of Marietta, passed away surrounded by her family on August 21, 2018, at Heartland of Marietta. Born April 11, 1924 to the late Robert and Hazel Woodford Lowell in Noble County. She was preceded in death by her parents, her late husband and love of her life of 61 years William “Bruce” McKitrick, granddaughter Andrea Gray, grandson Rusty Sellars, and brother- and sister-in law Chick and Doris McKitrick. Weezie loved spending time with her family and numerous friends, and never needed an excuse to plan a get together, cook them a meal, bake a cake, and raise her glass of Canai. She looked forward to her Friday night dinners out with the girls, played a mean game of Solitaire, Shanghai, and Train. She was the most loyal Buckeye fan anyone has ever seen and she truly believed that if the Buckeyes were ever scored on, it was because the referee missed the call. Survivors include her 6 children, Mick (Pam) McKitrick of Marietta, Jan (Doug) Drennen of Marietta, Steve (Lila) McKitrick of Baltimore, OH, Scott (Debbie) McKitrick of Marietta, Pat (Connie) McKitrick of Steubenville, and Brian (Sue)McKitrick of Gallipolis. 20 Grandchildren: Michelle (Mike)Courtney, Christy (Jennings) Illar, Kelly Dawson, Bryce Sellars, Josh McKitrick, Adam (Traci) McKitrick, Ryan (Thuy) McKitrick, Mauri McKitrick, Katherine (Richard) Jones, Kyle McKitrick, Jamie (Jake) France, Sean (Lexi) McKitrick, Aubrey McKitrick, Matt McKitrick, Rebecca Richardson, Caleb McKitrick, Jacob McKitrick, Patrick McKitrick, Trevor Burton, and David McKitrick. 25 great-grandchildren: Alex and Justice Courtney; Evan, Justin, Eric and Brady Illar; Ashley and Melanie Dawson; Brenna Saso, Maddy McKitrick, Maddox and Bodhi McKitrick, Gabe, Michal, and Ariel McKitrick, Aryia Kaszniak, Dominic and Ella Jones , Isaiah Bruce McKitrick, Arabella McKitrick, Lila Richardson, Chris, Phillip, and Andrew Gray, and Elissa Andert. 7 great-great grandchildren, numerous nieces and nephews, and a very special friend Judy Watson. Services will be held at McClure-Schafer Lankford Funeral Home, Friday August 24 at 11am, with calling hours beginning on Thursday at 2 pm with the family present from 2 to 4 and 6 to 8. Burial will follow East Lawn Memorial Park. In lieu of flowers, donations may be made to the local Alzheimer’s Association to honor her late husband. The family wishes to thank the staff of Heartland for all of the love and care they showed Mary during her stay there. She loved that she could share her passion for Buckeye football with all of you.